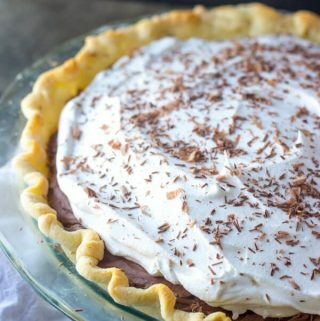 Silky, smooth and filled with chocolate this Chocolate French Silk Pie is easy, tasty and the perfect year round treat for all you pie lovers! Place pie crust in deep dish pie pan and bake for about 10-15 minutes until slightly golden, set aside to cool. Meanwhile in the bowl of a stand mixer fitted with a paddle attachment or hand mixer beat together the butter and sugar until light and fluffy. Add in your melted chocolate and continue to mix until combined. Add in your vanilla and cocoa powder. Add eggs one at a time, beating for 5 full minutes in between each addition. Pour the filling into the cooled crust and allow to set in the refrigerator for at least 4 hours. Top with whipped cream and chocolate shavings.